February | 2013 | Fitness Advice for the "Average Joe"
Weight Training to Build Speed, Power, and Vertical Jump! As I watched the Superbowl recently between San Francisco 49’ers & Baltimore Ravens and looked around at the incredibly big and strong athletes who spend countless hours in the gym training, I was reminded of the importance of weight training to become truly fast, quick, & powerful. But most people don’t understand HOW to train properly to develop speed, quickness, & vertical jump. So my purpose in writing this post is to take all of the complicated theories, books, and training methods that deal with building speed & quickness and summarizing the concepts for you in an easy-to-understand format to you can employ them immediately. I could talk about this topic for days, but I’m going to keep this post as succinct as possible, while giving you the framework to design the most effective workout for yourself. P = F * V. Power = Force x Velocity. F = M * A. Force = Mass x Acceleration. Formula (1) states that Power is a function of Force multiplied by Velocity. Simply put, the more Force (think of it as maximum strength) you can apply at the Fastest Speed (Velocity) possible, the more Power (Speed, Quickness, Vertical Jump) you will generate. So the faster you can lift a heavy object, the more power you will generate. A widely accepted rule of thumb is that it’s easier to increase your strength (force) than it is to increase your speed (velocity), which has more significant genetic limitations. For example, I can still remember the very first time I ever got under a barbell to do a bench press… I was a skinny little 15 year old, 120 pound Freshman in high school, and I had no idea what I was doing, but I remember being able to bench press ~120 pounds (1x my body weight) for several reps… more than a decade of consistent weight training later, that 120 pounds for reps essentially tripled to a max bench press of ~405 pounds at a body weight of 180 pounds during my mid-20’s (~2.3x my body weight). I read some research a long time ago which shows that you can increase strength up to around 4x from your starting point through consistent weight training… the point being that you can increase your strength much easier than you can your speed, so focus on increasing your strength to increase power. 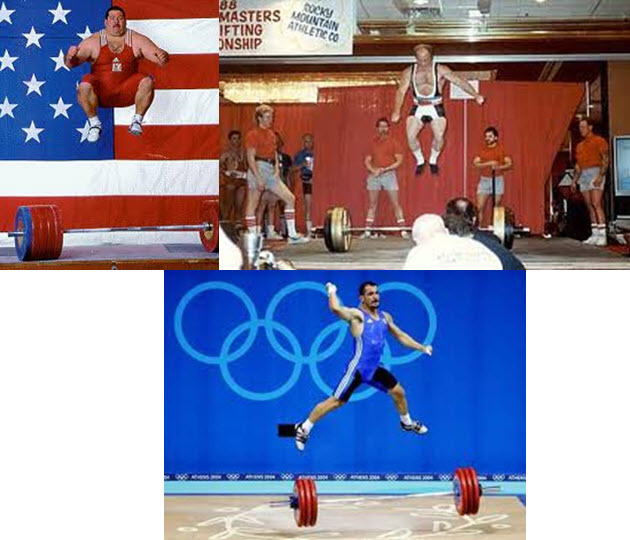 In case there is any doubt that increasing strength will actually increase your speed, quickness, & vertical jump, take a look below at some random Powerlifters jumping up in the air after a lift… powerlifters have such strong legs, their vertical leaping abilities are very well known (I especially love the portly, 300 pound dude on the left leaping high up into the air, which makes me smirk). In addition, I have not worked specifically at jumping in a very long time, but because my I can squat a lot compared to my body weight, I am still able to get pretty high up in the air (about ~35″). Formula (2) states that Greater Force is generated by either increasing the mass of the object or the acceleration applied to the object. No need to confuse yourself here… just think about FORCE as the Maximum Strength that you can apply to something. The key here again is to increase your maximum strength (getting as strong as you possibly can). Increase your Maximum Strength in the body parts that matter for your sport. For example, if you want to increase your vertical jump, increase your maximum strength in your quads, glutes, lower back, hamstrings, and Calves through key exercises like squats and deadlifts. You accomplish this by training VERY HEAVY, in the 80~100%+ of your 1-rep maximum range. For example, if your maximum squat for 1 full repetition is 300 pounds, then after performing sufficient warmup sets, you need to train with weights in the 240~300+ pound range for low reps, like 1~6 reps. When you’re training heavy, for any of the exercises where you are positioned underneath the weights (e.g. squats, bench press, barbell shoulder press, etc. ), make sure you have a spotter AND/OR use a safety cage to be safe to prevent becoming workout roadkill. Also, try to perform the reps as FAST AS YOU CAN. The key point is not whether the weight is moving quickly… in fact, it’s not possible to move your 1-rep max weight very quickly… rather, what’s important is whether your muscles are working and understanding that it’s trying to move the weights quickly. This helps to actually activate your Fast Twitch muscle fibers (Type 2A and Type 2B) and helps you to recruit more of these Type 2 muscle fibers, which also helps to improve your rate of force development, which is the next key point. Plyometric/Reactive Training: Plyometric training, first invented in Russia in the 1970’s, focuses on training your muscles to fire very efficiently, as well as quickly utilizing the potential energy that is stored via the stretching of the tendons (kind of like a rubber band that accumulates energy quickly, then releases). Weighted movements performed quickly/explosively: Use moderate to moderately-heavy weights for maximum results, say, in the 30~80% of your 1 rep maximum. But again, move the weights very quickly. Some examples of exercises you can perform are jumping weighted squats, jumping weighted lunges, medicine ball throws, etc. Increase your Velocity or Speed through Plyometrics and Training in the Actual Sport. Use Plyometric or Reactive Training. By nature, Plyometric exercises helps get you faster by improving explosive reaction time in your muscles. Continue to Train in the Sport or Activity that you are trying to Improve in. It goes without saying that if you are a boxer, continue your live boxing training, and if you’re a basketball player, continue playing basketball. No amount of strength training in the gym or weighted workouts will ever mimic the actual speed and neuromuscular coordination that training in the actual sport will accomplish. Lower your Body Fat, and thus your Body Weight. This reduces the weight that the Power you generate has to carry or launch in the air, and thus increases your speed, quickness, vertical jump, etc. Think about it this way: who do you think will likely jump higher… a 150 pound guy who can squat 400 pounds, or a 300 pound guy who can squat 400 pounds? My money’s on the lighter guy, assuming his rate of force production and velocity are equivalent to the other guy, or even if slightly inferior. It definitely pays to have good pound-for-pound strength. Anecdotally, I have a younger brother named John who’s about 5’11” or so… at his best, I’ve seen him do reverse slam dunks while pulling the ball down to his mid-chest level with both hands (below is a video of him dunking)… not bad for a guy of his stature. But what’s amazing to me is how much effort he put into his vertical jump, and how much I saw him improve, when he was a kid. What really helped him in the jumping arena was him developing serious leg strength via heavy squats, as well as improved muscular efficiency, velocity, and efficient force production via plyometric exercises. One summer during college, I remember training with him at Sand Dune Park in Manhattan Beach, which has an intensely steep and high hill made of sand, where we would hop up the hill with weights strapped onto us (I remember it well because I vomited at the top of the hill after my first workout session). But John worked hard throughout the summer and worked on plyometrics and squats… after which, he was skying and throwing down the basketball with ease. Categories: Chest, Legs, Plyometrics, Resistance Training | Tags: Explosiveness, Jump Training, Maximum Strength Training, Plyometrics, Power Training, Quickness, Rate of Force Development, Speed Training, Vertical Jump | Permalink.